There’s nothing more exciting than a new car in the making. When a manufacturer announces a new model is in the works, you may head online to find out more. Rumors start swirling. You keep clicking around, hoping for more information. This could be the perfect car for you! And ever since Ford announced the Atlas Concept, we’ve been thirsty for more information. Below is a sampling to whet your appetite. Ford does it right when it comes to designing a pick-up. The Atlas Concept marks a new era for Ford pick-up trucks, showing off how Ford is going to approach the production of their trucks from now on. There’s no doubt that it features contemporary attributes both inside and out. What we love most about the pictures and videos floating around is that the truck design maintains the unmistakable Built Ford Tough® look with its width, large wheel arches, and grille. The cabin houses a sleek modern finish with some cool technology built right into the car’s system. 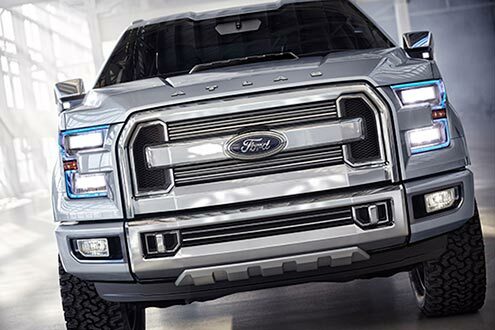 - LED Lighting: The new design incorporates LED lighting all over the truck: headlights, tail lights, cargo box, side mirror lighting. - 360° Camera: The dashboard holds a 360° point-of-view camera that projects view of the truck that allows drivers to be completely aware of what is alongside them at all times. This is a Ford truck first, and it allows drivers to work through tighter places with ease. 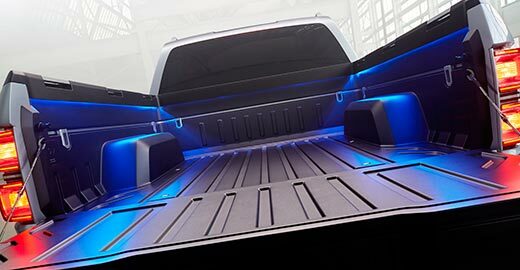 - Dual-Purpose Tailgate Step and Cargo Cradle: Ford is taking their already awesome tailgate step further with this model. The cargo cradle extends from the cargo door upwards—aligning with the top of the cabin—to lift and hold longer cargo items, freeing space. All truck owners could use ramps, right? That’s why the Atlas Concept is equipped with hidden cargo ramps. Loading the bed of your truck just got easier. How will the Ford Atlas Concept be received? So far, all the information out there makes the truck sound astonishing. We can’t wait to get this thing on our lot and out to our customers. What else have you heard about the new design? Share in the comments section below! 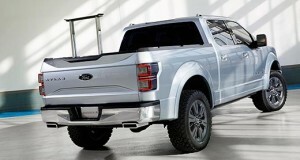 Posted in F-150, Ford, Future Vehicles, Industry, Technology and tagged Automotive, Concept, Truck.